CRG Plumbing & Maintenance carry out all work ourselves, where possible, and try to avoid outsourcing services and tools. This enables us to provide a much more efficient, cost effective, and reliable service for our customers. Thus, we have our own excavator so we can provide excavation services. 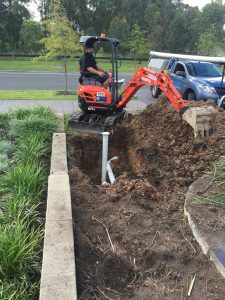 We own and operate our own excavator onsite where needed, and can offer plumbing excavation services for drainage issues where you need to dig down to the pipes or excavate new trenches. 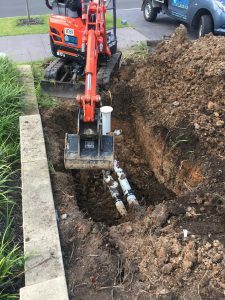 We can offer excavation services for both residential and commercial drainage solutions, from small to large jobs. This is suitable for landscapers, builders, plumbers, electricians, concretors, pool builders and home owners alike. What is the benefit to you as our customer? We can clean the site up more efficiently. Your dealing with just one company, us. For peace of mind, knowing your requirement will be completed from start to finish using only the best tradesman, materials and resources, let CRG Plumbing & Maintenance be the only call you make. Call us now on 0438 517 552 or 4656 4064 to talk about your excavation requirements. Have a commercial property? We specialize in preventative maintenance and servicing of commercial properties. Learn more about our commercial plumbing services here.